In the wake of this week’s negotiations in Bonn, what are the challenges still facing the upcoming Paris conference on climate change this December? 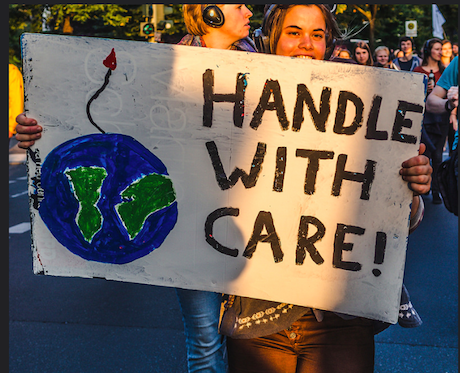 Protestors at Berlin's Silent Climate Parade, September 2015. ekvidi/Flickr.com. Some rights reserved.The last round of negotiations before the much-anticipated Paris Conference kicked off on Monday in Bonn. With only five official negotiating days left before Paris, those involved in the talks have plenty of work ahead of them before agreeing on what will hopefully be a legally-binding agreement next December. Discussions in Bonn resumed under a tense atmosphere, with the majority of developing countries involved expressing their frustration on the non-paper note produced by the two co-chairs of the Ad Hoc Working Group on the Durban Platform for Enhanced Action (ADP). The ADP is the body in charge of developing some form of protocol or instrument with legal force, under the Convention applicable to all Parties, and expected to be adopted by all United Nations Framework Convention on Climate Change (UNFCCC) Parties in Paris this December. This instrument that should become effective after 2020 is likely to become the most ambitious and comprehensive agreement to tackle climate change yet. On 5 October, Ahmed Djoghlaf (Algeria) and Daniel Reifsnyder (USA) presented the aforementioned note as a potential basis for future discussions. By reducing the text from 76 to 20 pages compared to the last negotiation round, the co-chairs left a series of issues – dear to developing countries’ hearts, though not exclusively – out of the document. The G77+China Group, which represents 134 developing and emerging nations, declared before negotiations resumed that the text was imbalanced and biased in favour of developed countries. According to Harjeet Singh from ActionAid and cited by Climate Home, “Most options that G77 put forward were not reflected… adaptation, loss and damage, finance – you don’t see those options”. In particular, one of their main demands proposing a mechanism to deal with loss and damage caused by climate change was largely ignored in the co-chairs’ note which merely recognised the issue. Neither the concept of equity, central in UNFCCC processes since 1992, nor the reference to fossil fuel subsidies survived the drastic cut. Yet, the end of these subsidies is essential for the decarbonisation of the global economy, an objective supported by many Heads of State and Government at a lunch during the UN General Assembly last month and at the past G7. Civil society, for its part, deplored the removal of a reference to the objective of zero emissions, as well as another mention of the need for emissions reduction objectives for the shipping and aviation sectors. Even the European Union expressed its disappointment through its Climate and Energy Commissioner Miguel Arias Cañete who declared in a tweet that the EU and others would work hard to improve the document. These issues and many others will have to be clearly addressed in order to make Paris a success and are likely to be largely discussed over the coming days. One of these issues –which wasn’t axed but strongly needs clarifications – is the setting up of a mechanism that will regularly review and improve Parties’ emissions reduction contributions. To date, over 150 nations, representing about 90% of global greenhouse gas emissions have submitted their INDCs (Intended Nationally Determined Contributions, or emissions reduction pledges) to the UNFCCC secretariat. According to an analysis by Climate Action Tracker, a consortium of four research institutes, if these pledges were implemented, global warming could be limited to 2.7°C, compared to 3.6°C in a business as usual scenario. Although this is a significant improvement, these commitments are not enough to remain within the 2°C limit recommended by scientists. It is therefore essential that Parties put in place a mechanism to regularly update and increase the level of ambition of their pledges in order to ensure the effectiveness of the future agreement. Given the strong resistance of a large number of countries to resume negotiations on the basis of the non-paper note, co-chairs welcomed new insertions from Parties. On Monday evening, various issues were proposed related to human rights, gender and indigenous peoples’ rights. After two days of negotiations, a series of issues considered “must-have” items were brought back into the document that will be recognised as a basis for official negotiations. Now 34 pages long, the draft agreement reintroduced some elements related to loss and damage and a global decarbonisation goal whose size is still largely considered as “manageable” by climate experts. The mention of the $100 billion yearly climate finance objective that had disappeared in the non-paper note was retabled in the draft agreement. The issue of climate finance is indeed crucial to ensure the predictability of income and adequate planning for adaptation and mitigation plans. Current discussions in Bonn are crucial to ensure that a deal is within reach in Paris. It is particularly essential that the co-chairs regain the trust of the G77 countries which has been put under such great strain in the past few weeks.